Badbeat.com, the original and leading poker staking site, is re-launching this summer with the addition of MyGame, a free online poker training and analysis system unlike any other. Badbeat.com will continue to develop and sponsor selected poker players through their advanced staking and personal mentoring system. The existing analysis, training and reporting technology will be taken to a whole different level and is now available to any poker player. The new system is designed for any player that wants to learn, win and transform the way they play poker - all for FREE. It will build the player’s poker skills from the ground up by analysing actual play, spotting weaknesses and then fixing them. Access to poker tutorials, the unique hands analysis tool, Report Cards, and Social gaming features will be free after registering with any of the leading online poker rooms with which BadBeat.com is affiliated. Badbeat.com stakes many professional players, providing financial backing, mentoring and guidance to help them develop their game without them risking their own finances. 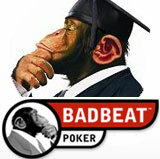 Badbeat.com sponsored poker players will continue to receive cutting-edge software tools and a structured development path with advanced learning aides, coupled with the knowledge, expertise and support from a pool of world class mentors and support staff. With the new online poker training facilities, many more poker players will benefit from their advice. If you've tried the new poker training tools at BadBeat.com please use the Comments box below to tell other players what you think of it!